I was getting my pedicure and manicure yesterday with my best girlfriend and her sister (also my good friend) and a reminder popped up on the calendar on my phone that said, "Powdered Wig." "What the heck is this?" I asked myself. Then I remembered my conversation with my bff the night before when we were coming back from Oporto, a great wine bar in Houston. When we were leaving Oporto I saw the M Hair Salon next door and I told her that I've been there before to buy my Bumble & Bumble powder hair spray. I have SUPPPEEEERR oily hair and I can't skip one day without washing my hair. If I do I have to spray my hair with Bumble & Bumble in brown. Sometimes I need to spray it even if I've washed it but I'm still having an extra oily day. The spray works a lot like baby powder does. When someone has really oily hair they sprinkle baby powder in their hair and then comb it through. The powder absorbs the oil and then the hair looks less oily and is fuller and more manageable. My friend told me it's called Dry Shampoo, I didn't know that. I just call it my spray powder. Three years ago I read about Bumble & Bumble in Oprah magazine and I decided to try it. LOVE IT! It is so great for those days when I don't wash my hair. I just spray it, comb it through after it sets, and violà, I have semi-non-oily hair again. I was telling my friend that the only part I don't like is the texture of my hair. It gets kind of too dry sometimes or I have a pouffy feeling. She asked if it felt like a powdered wig and that is EXACTLY what I imagine a powdered wig would feel like. 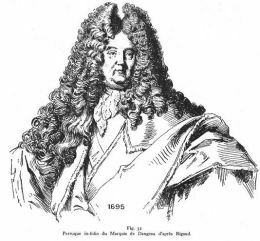 They say that fashion repeats itself so I guess the powdered wig is back in style only this time it's disguised by the dry shampoo look. Very quick 10 minute blog. Vacation was fabulous with the good, the bad, and the ugly. I fell down twice, don't ask me how. Once I fell all by myself in my kitchen and the second time I fell at Baskin Robbins. Probably a message that I did not need to be eating ice cream. 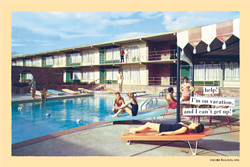 That makes this Anne Taintor magnetic postcard even funnier now. I used it on my skirt! blog when I was getting ready to go on vacation. I ran around town with the kids to the doctor, the dentist, the Children's Museum, and the Museum of Natural Science. Then we ended it with a fabulous 3 days at the beach. I absolutely LOOOVED that and will do it again one day. We rented a cute cute cute little hotel called The Breeze on Surfside. It faces the beach and we spent the entire day on Saturday on the beach. I have the tan to prove it. I came back with a broken a/c in my SUV but that's fixed for now. I also found out that my little one has a bacteria in his tummy. Something we will have to treat for 14 days. FUN!! More on that later! School shoppng is almost done, at least all the uniforms part. All we need are back packs and lunch kits now. I wonder if they sell lunch kits with a GPS inside for my little one. He is guaranteed to lose his lunch it at least twice in the school year. This is the last weekend of our summer vacation and our 14th anniversary. Our last anniversary. Bittersweet...We are trying to decide if we should do anything. Maybe dinner with friends on Saturday. I thought of this poem by ee cummings when I was thinking of writing this blog. I thought it said, "I carry you with me" but it actually says, "I carry your heart with me." Same difference. I'm on vacation this week with the kids. I'm a stay at home mom for a week, but I'm not going to do much cleaning and housework, just cooking for the kids. We have plans every day this week. Today was my relaxation day. I only planned to do two things. I took my son to the doctor and found out he has acid reflux, my poor boy. He's already a picky eater as it is and now he can't have any carbonated drinks, spicy food, or red sauce. We were also going to go to the library but the library we were going to was closed today while they get on their new schedule. So I came home to relax but ended up doing a bunch of other things, like working. 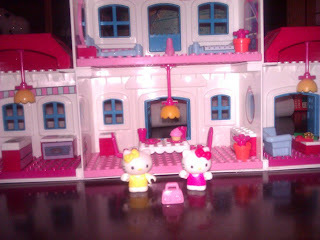 Later I was forced to play with this Hello Kitty doll house with my daughter. Well, not really forced. 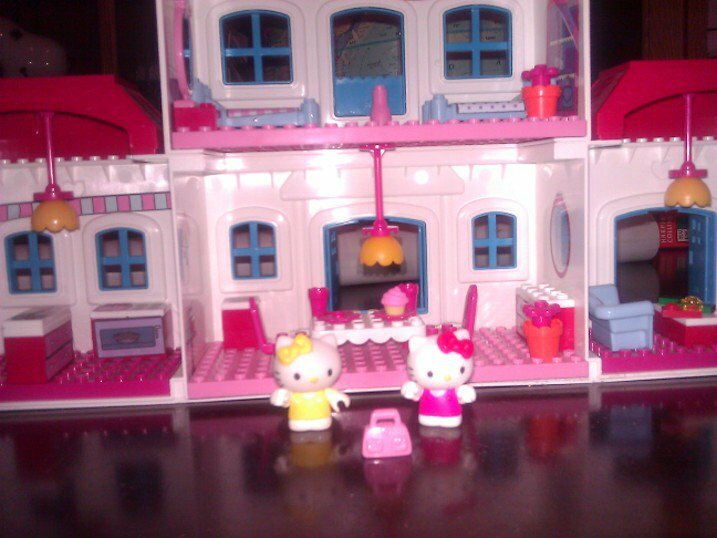 I played Hello Kitty's twin sister Mimmy. It was fun. I hardly ever play dolls with my daughter, but I was reminded of how much I used to love little dolls and houses like this one above when I was a little girl. As a working mom I don't get to spend as much time with my kids so weeks like these are precious as well as exhausting. But even when they're not with me during the week while I'm at work they are with me. Almost weekly I can open my purse on any random day and I'll find a toy that hitchhiked a ride with me to work. Once a few weeks ago I was getting off my SUV for a sales call and I noticed that the kids left their ruler in the back seat. I grabbed it and stuck it in my folder in case I needed it. In the end I didn't need it, but when I went back to my SUV I glanced down and saw a tiny green monkey stuck by his head in one of the holes a the top of the ruler. I laughed at the thought of what would have happened if I DID need the ruler and I pulled it out in the middle of the sales call. I told the kids the story and I told them that the monkey wanted to come to work with me. It was a crazy looking monkey too, with a little pink tongue sticking out of the corner of his mouth. That's not even counting all the little toys that stay in the back seat of my SUV too. I carry them to work with me every day and when I see them I'm reminded of my kiddos. That's why I said, "I carry you with me" because my kids are with me in a way every where I go. This week is our week or as my daughter is calling it, "Mommy Week." We are going do a variety of things that include the museums and then the beach. I'm really looking forward to the beach part! We'll be there 3 days and I'm planning on just lying on the beach with a drink in one hand and a book in the other. I've never stayed right on the beach before. It's a really small motel and all the rooms face the ocean. I can literally walk out of my room, across their lawn and I'm on the beach. I can't wait!